Not ready to commit to New Mail? 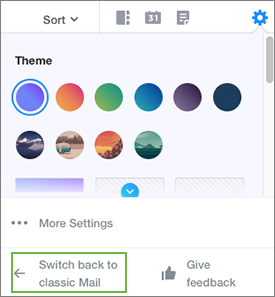 You can switch back from New Mail to classic mail. If you're already in classic mail, it's not possible to switch to an older version of Yahoo Mail. Go to your Yahoo Mail account. Click the Settings icon at the top-right of https://mail.yahoo.com (not the icon on this help page). Click Switch back to classic Mail at the bottom of the window. From the "Tell us why you want to leave" drop down menu, select a reason. In the provided field, enter additional comments. Click Switch back to classic Mail (only clickable if you do steps 3 and 4). Which version of Yahoo Mail am I using? The bar above your mailbox has a distinctive look for each interface, similar to the images below.